Disappointing news for collectors and completists. Puffin has confirmed for me that they currently have no plans to produce a By Royal Command Limited Collectors Edition. The first four Young Bond books were all released as Limited Collector’s Editions in the UK. These signed, numbered, slipcased volumes were published as Waterstone’s exclusives and sold for £25. However, the economic downturn last year forced retailers to tighten their belts on such specials, and Puffin decided not to produce a BRC special, saying they’d explore the possibility in 2010. 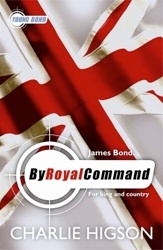 But the news today means it’s unlikely that we’ll ever see a By Royal Command Limited Collectors Edition.